The Converse Blog: On the naming of the new "Balls Technology", some people might find the name a little risqué. How did the name for the technology come about and was it close to being named something else? DiTullo: That’s a pretty good story. Personally, I love macaroni and cheese because macaroni and cheese is macaroni and cheese, right? There’s just something about when you just name something what it is that, to me, it’s just honest and I love that. So, we had been calling it Balls internally all along, all of us are like 99% sure that that was going to change. We were like ’This’ll never stick.’ But that’s what they are, they’re balls, so that’s what we had called it. We’ve probably had like 250 to 300 meetings on what we should name it. We just never came up with anything better than Balls. Yeah, there’s a lot of tongue-in-cheek fun analogies that you can make but also it kind of explains what it does really easily. Coming from a big company, I think showing that we can have a little bit of fun … not a bad thing. At the end of the day, me and my team, we get paid to draw shoes all day. We have a really fun job. Sometimes all these technical benefits that we’re all really working hard to provide just come off so serious. The game of basketball is a game and it’s a super fun game. I think Balls just kind of connects to that. 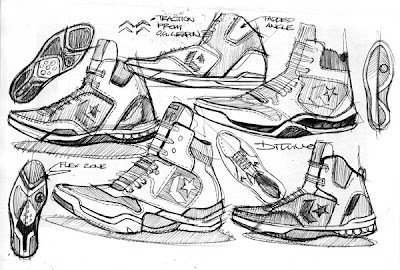 TCB: Your original Weapon Evo sketches from 2007 had sketches featuring a full-length hit of the Converse Balls Technology. Would that be something that we could expect in future releases? DiTullo: We designed these technologies to be scaled. So, we wanted to be able to offer it in different packages or different price points. You’ll definitely be seeing a lot of variations. TCB: The patent pending number on the outsole of the Weapon Evo refers to the design making use of the spheres and the Converse Helium logo. Could Balls Technology evolve to include helium in the same way that there's Nike Shox with air in it now? DiTullo: Well, I wouldn’t be able to comment on anything like that but the spherical patent is a patent that Converse has held for a long time, and if it’s not the strongest patent in the marketplace, it’s one of them. I was researching through our patent documents and I was like ’Yeah, we should just do something with this thing because it’s just sitting here and it’s kind of a little gold mine of an idea here.’ I’m not one of the best designers, I don’t think. I don’t put myself in the top list. I think what I’m really good at is finding those nuggets, those things that maybe someone else got frustrated with or couldn’t figure out all the way, and dusting it off and being like ’Wait a second, there’s something here.’ I think if you look at the Weapon Evo, it’s kind of got patent 360 with the Weapon-inspired upper and then the Balls Technology in the chassis. TCB: Is the Weapon Evo the most important release for Converse since the first Wade shoe? DiTullo: As a designer, I’m very proud of it and I’m often my own worst critic. I’m mean, typically, I’m never happy with my work. I’m always more focused on what’s on the drawing board right now. When I look at my work, I look at what I could’ve done better, what I want to improve on. Molly: Yes, it is an important shoe launch for us this fall for a number of different reasons. 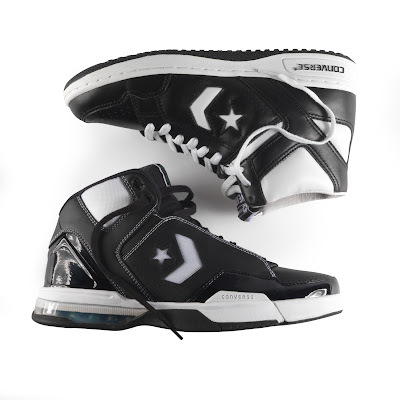 Really it’s the first team shoe that Converse is putting out with the new Star Chevron logo on it, so for us alone with that new logo, it’s a huge deal for us. So everybody internally is really excited about this shoe, from the work that Michael’s done over the past 2 years with it, to putting it out in the marketplace today. Dwyane Wade or not, this was going to be an important shoe for us, just alone from bringing back the Star Chevron mark. DiTullo: I was super psyched to work with the mark. For me, that’s Converse basketball. TCB: So the talks about bringing back the Star Chevron logo were around 2007 then? DiTullo: Yeah, when we started Evo. It was killing us just to leave it off stuff. Let’s just focus on the Evo and get it out there. Patience pays off. TCB: Is there anything in the works about maybe having an increased presence for Converse in the NBA or NCAA this season? People are watching Converse to see what’s going to happen in the near future. Molly: We’re having conversations about adding more ambassadors for basketball and we’re really going to try and take our time and work with people who really are Converse athletes and people that are willing take risks and do something differently. As a brand we always says we want to disrupt the status quo. So we’re really just taking our time and pushing the reset on who our ambassadors are and taking a look at that. Probably spending the next few months having conversations and doing some investigative work and seeing who might be available and what makes sense for us as a brand. Kyle Korver and Alando Tucker are going to battle all year for the hottest colorway. Is there any information on whether Converse will release a low-top version of the Weapon Evo? Yep, it's anounced they'll launch a low top soon, I haven't heard a date yet though. BTW, I heard some stuff about retro's, any chance there'll be a Converse Magic retro? Looks trendy! Where can I find them?